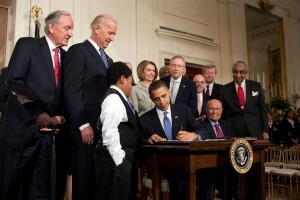 Saturday marks three years since the signing of the federal Affordable Care Act, and state health officials have been celebrating by touting the benefits of the health overhaul law. On Thursday, the nonprofit group Health Access released a report that determined more than one million Californians have been able to get coverage through new options provided under the ACA. Those residents include adults with low incomes, people with pre-existing health conditions, and young people who can stay on their parent’s insurance plan until the age of 26. “But much more is needed to be done,” said Health Access director Anthony Wright. Wright, Assemblyman Richard Pan and other health advocates urged Gov. Jerry Brown and lawmakers to pass a plan that would expand Medi-Cal -- the state’s health program for the poor -- and to pass bills that would ban price discrimination based on pre-existing conditions. ACA proponents also held press conferences around the state. On the steps of San Francisco city hall Thursday, officials hailed the Affordable Care Act's benefits, even as it means less money down the line for the city’s universal care program, Healthy San Francisco. Patient fees and employer contributions to Healthy San Francisco will stop as residents move to Medi-Cal or buy coverage on the state’s marketplace Covered California. Brigham said as more people move into health insurance under the federal law, costs for Healthy San Francisco will go down. She urged lawmakers and community leaders to do a better job communicating the benefits of the Affordable Care Act. “The worst thing that could happen is that come January 2014, people are not aware that health insurance is available to them at low cost,” she said. A recent Kaiser Family Foundation poll found that three years in, most Americans still don't understand the federal law and remain deeply divided over it.